In February (yes, I'm behind in my reading, why do you ask?) Discover Magazine listed "20 Things You Didn't Know about Movie Scientists". Not surprisingly, the few female movie scientists are often as much for eye candy as to drive the plot, the notable exception being Dr. Zira. 11. According to a 2005 study, less than 20 percent of scientists portrayed on screen from 1929 to 2003 were women. The research also revealed that almost all of the women were young, thin, and beautiful, although some did wear glasses. 12. In 1944 Greer Garson became the first and last woman to be nominated for an Oscar for a portrayal of a scientist. Her Madame Curie was young, thin, and beautiful, but did not wear glasses. The real Marie Curie did. 13. You've come a long way, monkey? One notable female movie scientist does not fit the stereotype: Zira, the simian psychiatrist from Planet of the Apes, was muscular and hairy. 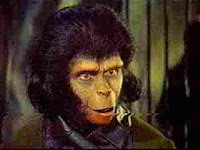 As we learn in Escape from the Planet of the Apes (1971), the third installment of the series, Dr. Zira vivisected and experimented on human captives, who in the movie year of 3955 are considered animals and thus expendable in the pursuit of scientific knowledge.